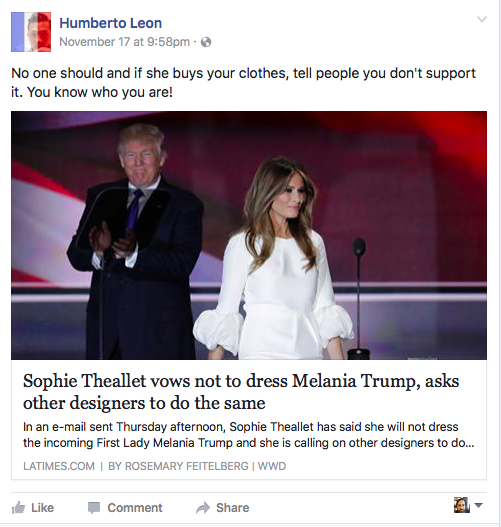 Fashion designer Sophie Theallet made news when she released an open letter to other fashion designers calling on them to refuse to design clothes for incoming First Lady Melania Trump. Even though the French designer had not been asked to make outfits for Mrs. Trump, Theallet’s call garnered a lot of favorable media attention. Now other designers are following suit, while others say they would be happy to work with the incoming First Lady. Both Jacobs and Altuzarra were among the many designers who designed shirts which were sold to raise money for Hillary Clinton’s campaign. This doesn’t mean Mrs. Trump will be without fashionable clothing for the next 4 to 8 years. Even anti-Trump designers acknowledge she can purchase and wear their designs and there’s nothing they can do about it. However, there are some top designers who buck the trend and say they’d be happy to dress the former model. Tommy Hilfiger said he’d be more than happy to work with Mrs. Trump. “I think Melania is a very beautiful woman and I think any designer should be proud to dress her. Ivanka is equally as beautiful and smart, although she wears her own clothes. I don’t think people should become political about it. Everyone was very happy to dress Michelle [Obama] as well. I think they look great in the clothes. You’re not gonna get much more beautiful than Ivanka or Melania,” he said. Expressing a hopeful tone, designer Carolina Herrera thinks everyone will eventually come around. “I think that in two or three months they’ll reach out, because it’s fashion. You’ll see everyone dressing Melania. She’s representing the United States,” she said.